Claudia is the Operations Coordinator at Prospera. Prior to joining the team at Prospera she graduated from the program “Explora tu Cooperativa” in 2018 and was a volunteer at the Prospera’s 2nd Summit for Latina Entrepreneurs. She brings to Prospera over 12 years of administrative, finance and operations experience working with International nonprofits in Colombia and the US. Her previous job was with The HALO Trust, the world’s largest humanitarian mine clearance organization. During her tenure at HALO, Claudia supported the ED, DD, finance and program teams making sure the daily operations were running in a timely and effective manner. Claudia started her career in the non-profit sector working for Mercy Corps Colombia, an organization that provides humanitarian aid mainly for IDP’s of the Colombian conflict. Her main roles were to assist the Finance and Administrative teams as well as be the logistics coordinator for travel, workshop and events. Claudia is an immigrant Latina with a passion for serving her community and getting involved in social justice. 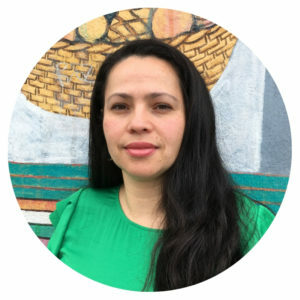 She lives with her husband and toddler, Gabriela, in a cohousing project and is also a member of her daughter cooperative pre-school. Before moving to the US, Claudia attended Business and Law Schools in her native country Colombia. She enjoys traveling, dancing, meeting people from other cultures, hosting gatherings around food for her community and friends and visiting her family any time she can.